At present the related Connecting Devon and Somerset (CDS) project is working with Openreach (BT), Gigaclear and wireless ISP Airband to extend the reach of “superfast broadband” (30Mbps+) across the two rural counties and overall they aim to cover 96% of premises by 2020 (currently 86%). A mix of FTTC, FTTP “full fibre” and Fixed Wireless Access (FWA) based broadband technologies are being used (see here and here). Back in June 2018 the £171m CDS project posted an update (here), which revealed that Gigaclear’s phase 2 roll-out in the area had been slowed by the fallout from Carillion’s (contractor) collapse. Nevertheless the ISP still expected to complete on time. Telent took over from the Carilliion telent partnership and the provider also introduced additional resources (e.g. McNicholas part of the Kier group) as well as other contractors to compensate. Sadly it appears as if those delays, which became “apparent at the beginning of the year,” were more significant than first reported. Today’s update from CDS notes that “fundamental issues existed including management of subcontractors, build methodology and capacity within the team” (e.g. it’s been difficult to find enough skilled engineers, which is an issue we’ve highlighted a few times before). The gravity of the situation is understood to have surfaced at a meeting last month and since then Gigaclear has been busy formulating a new plan. “On behalf of Gigaclear plc, I would like to apologise for the delays in delivering a full fibre network across rural Devon and Somerset. Whilst the first customers are now connected in East Devon, the project is running significantly behind schedule and we accept our performance to date has fallen short of the high standards that we set for ourselves. * A significant number of new regionally based staff in a variety of roles such as network planners and community liaison personnel have been appointed and trained to provide more on-the-ground support for residents. We are continually reviewing the requirement and will act quickly to add more where needed. * Restructuring the roll-out to incorporate a range of new construction techniques that are focused on reducing delays, whilst continuing to deliver full fibre to the home. * Changing our plans to minimise disruption on key transport routes, without impacting speed of delivery. The situation means that any previously published deployment dates under the original plan, unless already delivered, should be ignored. Gigaclear is planning to present a new plan to CDS that they hope will “re-energise this rollout programme.” No doubt other local authorities, such as those that are also considering the ISP for future contracts, will be paying close attention to what happens next. However the CDS team has posted a Q&A page on the problems, which notes that “Gigaclear is having delivery challenges in a number of other areas, however none of the other areas are subject to the delays which the CDS programme has experienced.” We should add that any overspend incurred as a result of all this will be Gigaclear’s problem to sort out with their contractors. Gigaclear has been instructed to provide a full remedial plan to improve its performance in each of the five CDS contract areas. CDS will consider the revised plans and whether the extent of the delays expected are acceptable. In fairness Gigaclear wouldn’t be the first operator to run into problems with a major rural deployment of FTTP (e.g. Openreach’s challenges in Wales), although the reasons aren’t always the same and the scale of such issues can vary. In this case the ISP had a large contract and they needed to scale-up quickly in order to meet expectations, which clearly hasn’t gone quite according to plan. The news will obviously come as a huge blow to those waiting for the new network to arrive. All those affected will now be waiting for the new plans to surface. On the upside CDS has been assured by Infracapital, the owners of Gigaclear, that they remain committed to deliver the five contracts and can provide the available funding needed to achieve this. This is hardly a surprise as doing anything else would have cast doubt over their other contracts. Credits to Thinkbroadband for pointing us to this development. Yes, I agree about delays in Gloucestershire – I have given up waiting in Fastershire’s area. The planned date for my area has changed several times and is now just as far away as it was 18 months ago. Of course there is no real information about progress. Fastershire’s website says the build in my area will start in Sep 2018 (no sign of it), while Gigaclear’s says Q1 2019. Speaking to Gigaclear they say end Q1 2019 or so to start, but it is expected to take a year to complete. However, as they are building out from Gloucester they have a lot of other areas to build before they get to my area (one of the most distant) and there is no sign of any works being planned for most of them. Given the lead time for planning, I’m expected significant delays. Annoyingly, Voneus were advertised as providing a Wireless solution as a stop-gap before Gigaclear became available (and FTTP after that), but when I asked they admitted they can’t provide wireless until Gigaclear are already in the area. I can’t find any mention of that on their website now. so maybe that collaboration has fallen by the wayside? 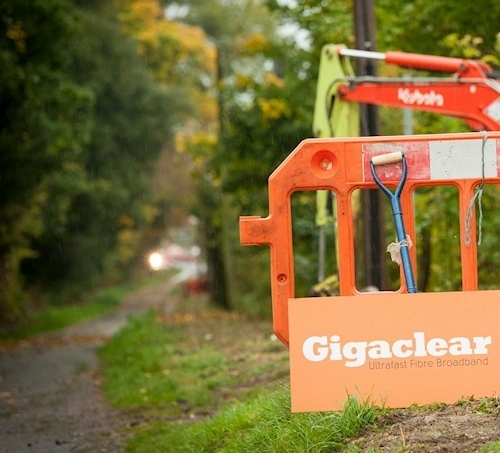 Superfast Northamptonshire phase 3 was awarded to Gigaclear. We have just had our installed and we were one of the 1st areas, but the contract was supposed to be completed by the end of this year. It is clearly going to overrun hugely here too. I gather that there are similar delays in Northamptonshire too. The original BDUK Openreach rollout was not without its delays either, ending about a year late overall. It took Openreach a long time to gear up to a full deployment. So I am just ensuring in the interests of balance that no one thinks that Altnets are the only ones that this affects. The early work in E Devon went pretty well – although that was before the contractor issues..hope they sort it as actually I think their Fib deployment method is much better than ORs in the long term. Gigaclear met the required number of properties to be connected by Sept 30 in Lot 3, but failed to meet the target in Lot’s 1,2 & 5. It would help for these numbers to be published as it is no great surprise that some slippage will occur after a project of this scale has been running for 18 months. It is also worth remembering that the Gigaclear and Airband roll out began two years behind schedule because they were only awarded contracts on CDS’s third attempt to find suppliers – two previous tendering attempts having been abandoned by CDS. The delay in the contract award has nothing to do with the fact that Gigaclear have entered into a contract not understanding the delivery details and are horrendously late in delivery. Yup, but it is a very strange employment market in construction and groundworks at the moment. A lot of the previous eastern European workforce has disappeared and been replaced by other eastern European workforce since the BREXIT vote. It has an utterly bizarre feel to it. That of itself is not the issue but rather the yawning skills gap where you have to explain and train everything from scratch. So replacing a big chunk of workforce is not easy peasy. But we were told it would be. There are thousands of British people desperate for work, we were told. Just queueing up. No need for benefit payments any more. Sunny uplands ahead. Surely that wasn’t some sort of untruth ?? Surely not ?? There is one glaring omission in the councils Q&A: while it asks and replies how many customers Gigaclear have nationally (16000), there is no mention of how many home are now passed in Devon & Somerset nor how many customers are connected in Devon & Somerset. Surely if reporting on the contract performance, stating a progress update you would include the actual number of properties passed – CDS always managed to do this with BT! Can we assume it is so bad it can’t be mentioned? In the interim, Gigaclear is continuing its roll-out at the company’s own risk where work has started. Even though there is delays which I completely sympathise with I think Gigaclear is a better solution to BDUK than Openreach. @Matthew: Agreed and whilst any delay is regretable, the Gigaclear service once it arrives is the best fibre broadband service you can – speaking as a Gigaclear customer in Devon! Not sure how it is “better”. Openreach’s network has more support from ISPs and is a known quantity, plus it tackles the question of existing services (their FTTH ONTs can do PSTN). I value having a choice of provider which is something that the alt-nets still haven’t got. They seem to be having fewer troubles rolling it out too. On the other side of the river, in Cornwall, there’s a surprising amount of OR FTTP everywhere from town centres to literally the middle of nowhere. Not as much as I’d like, but it’s still substantial. Not sure about the whole “we’ll run up to the edge of your property, you sort out the rest” methodology either. Still, at least Gigaclear actually manages to do something – it’s not a constant stream of PR stunts as CityFibre seem to be using to cover their lack of progress. Gigaclear is better because they are deploying FTTH and Cornwall is a very minority case rest of the UK is opposite more FTTC hardly any FTTP. Cornwall is the outlier specially in rural areas. Not sure what you are talking about with CityFibre they have a substantial business core network in a fair amount of UK Cities already and they are just getting underway with there home FTTH network customers will start getting connected very soon. I am comparing like for like i.e. OR FTTP vs Gigaclear FTTP. While OR may have “hardly any FTTP”, if I remember correctly they are still the largest UK FTTP operator. Cornwall was a good example because of its proximity to Devon and because of its similar circumstances (CDS aren’t doing Exeter or Plymouth, they’re doing rural areas). It shows what OR is capable of if they wish – and with recent announcements that seems to be the way they are going. Similar delays here in North Herefordshire. They have just pushed back by another six months and will be starting in June 2019 allegedly. Decent broadband has been dangled in front of us for 3 years now, at least another 1.5 to go. But at least in North Herefordshire Gigaclear have 10 of 37 areas under construction. In South Herefordshire and Gloucestershire they have only 4 of 52 areas started, and current rollout dates show the last area due to be completed in Q3 2022 – that is 4 years away! I hope that is a typo on their website, but I suspect it might not be. What is scary is that Gigaclear went out to market, got contractors on board and are still behind programme. The limited skills in the industry both to work for companies such as Gigaclear and for the contractors is a significant problem that doesn’t seem to be readily solvable. Pity CityFibre who are way behind the curve and who haven’t even got themselves fully underway yet after a year of promises. Being an open market both of these issues will self heal in time as the demand is there. This is why there are huge amount of duct and fibre in the ground awaiting being made live all over the place by lots of providers. If you look at Gigaclear website, will see that the contract was awarded to Carillion telent for the entire area. Since the Carillion fallout, telent took over. They do not have enough resources and do not pay their subcontractors. That’s why everything gets delayed. Gigaclear should start looking at smaller contractors in the area and award part of the contract to them, instead to a large company like telent that takes advantage of subcontractors and very poor managed. How is the West Oxfordshire build going? Last I heard that one was on schedule. You’re presumably discounting the previous contract that had extensive delays and was ultimately terminated? The one between the council and a company acquired by Gigaclear? The problem on the CDS is that the contract was awarded to Carillion telent. After Carillion fallout, telent took over for the entire project. I heard many rumors that subcontractors working for telent did not get paid for the work that they put in. That’s why many left. Also telent poorly managed this project with providing resources, surveying and the local authorities. I was always interested to understand how Gigaclear could deliver a full fibre solution in a timescale that was so much quicker than BT and we now have our answer. If you look at South Devon then areas that were due to go live in Q2 2018 have street works scheduled through Q4 and into January so it looks as if 6 months work will extend to at least 12 months. I suspect this points to a 1 to 2 year overall delay to completion of the Project. It is actually worse than I thought. The first areas in South Moor are showing a go live of Q2 2019 when originally they were scheduled for Q2 2018. Amazing that you can end up with a 12 month delay on a 6 month build. It clearly shows that Gigaclear’s plan was fundamentally flawed and begs the question whether CDS sufficiently probed those plans during the tender process. They had the benefit of extensive prior negotiations with BT about Phase 2 so they can’t claim that they didn’t have an understanding of the scale or complexity of work involved. IIRC one of the main reasons CDS gave for re-doing the procurement was to speed up delivery. The net result of the overly slow procurement, delayed start to deployment and extended delays in delivery appears to be a slower overall programme. Don’t you just love local government bureaucrats! As you say, an independent audit to hold the CDS team and politicians to account would be a logical next step. And is long overdue! The Gigaclear rollout delays have spread to Fastershire too – many of the dates have been moved back 9 months. I don’t know whether Gigaclear have changed the dates for other BDUK areas too as I haven’t made a note of those. The date for my area is now further in the future than when Gigaclear were awarded the contract, so progress has been negative so far!